"Premier-Bar" is the cafe of "Premier-Hotel", so as it’s an independent organization of food service. 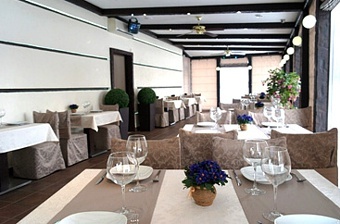 "Premier-Bar" is a unique interior, modern style, hospitable atmosphere and an excellent cooking, combining traditions of European and Russian cuisine. A cafе hall for 20 people and 40 people will be suitable as for public lunches, so for wedding parties, anniversaries, company holidays. 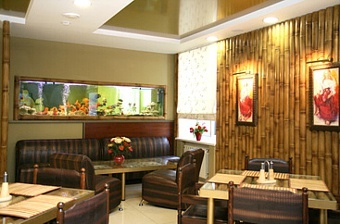 Whatever aim you have a wide variety of different meals and drinks, good service will delight you. For conference and banquets the cafe hall is equipped with TV with 60 inches diagonal and possibility to connect notebooks, sound system, flip-chart, markers. Compatibility of equipment is better to check beforehand. We can organize coffee-break or lunch. weekends and holidays – from 8AM till 12 AM. Lunch and dinner are served at any comfortable time for a guest till 11PM. Weekdays – from 7AM till 12PM. Weekends – from 8AM till 12PM. From 7AM till 11AM – various hot breakfast. From 12AM till 3PM – substantial business-lunches. From 7AM till 12PM – European and Russian cuisine. Corporate new year Banquet - an event that now evokes pleasant thoughts of the servicemen and headache management. The organization of the holiday, is able to raise corporate spirit, to cheer and inspire, is generally not an easy task, and the New year - as is the case when the last thing that you want to answer for yourself. What new year's magic, if thoughts - the solid parts. To feed, to drink, to entertain, not to forget...Prime Bar will help you enjoy the holiday in full and will take over your care fully or partially. Sincerely, Director Gottlieb Yulia Yevgenievna.